Ladies, it’s time to put down those salads and eat more pizza with abandon. We’ve heard it directly from the mouths of men: they’re not looking for a gal with six-pack abs! In fact, the thing that men find super-attractive? They want ladies with a bit of a belly, it turns out. 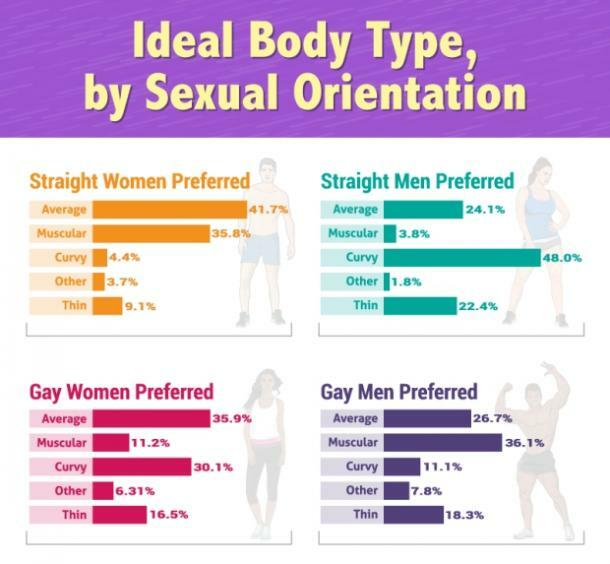 Thanks to a survey by FitRated, we can now tell what people are looking for in the “perfect” body based on age, gender, and sexuality. The survey included 2,000 people to find out what kind of body they’re most attracted to, and the results were quite surprising, to say the least. So what exactly are people looking for in their dream matches, at least physically? According to the survey, gay men are the choosiest, in that they prefer a man with a buffer build than average. And straight women, it turns out, aren’t interested in their own Fabio-esque built man (you can pass him on to gay men, who will love him), despite what romance novels have taught us. What precisely are straight ladies looking for? An average guy. The statuesque physique you men have spent years perfecting with crazy workouts? Unnecessary. All a woman really wants is a man who can eat some junk food with her and be tall enough (or limber enough) to kill any bugs that wander into our houses. Gay women are also into women that are average, and they’re not looking for overly-muscular or curvy women after all. Straight ladies, you've been lied to worst. Men aren’t looking for someone whose waist they can wrap their hands around! In fact, all of those ab-toning exercises that we get guilted into doing? The shame over a “mom” gut or even a bit of belly bulge? Men are way into that, according to the survey. So throw out your ab toner DVDs, and start lifting a couple arm weights now and again, because men love a lady with toned arms and a little bit of a chubby belly. Flash that “carryin’ a little bitty weight” card and throw out any magazine, exercise guides, or self-help books that say otherwise. When a man is looking for a woman, he’s looking for a curvaceous beauty who enjoys life, not a twig-thin lady he can deadlift with one hand. Rejoice! This is freedom! The freedom to ease off of those terrible crunches that are actually really bad for you; the freedom to pick that pizza up and actually enjoy it without feeling ashamed. So if you’ve got a bit of a belly — which is natural for a being that carries extra weight so we can produce offspring — you are beautiful, desirable, and already totally ready for beach body season. So get ready to show off your luxurious, natural curves.